The integration of a professional golf tournament and its host community was on full display this past week at the LPGA Volvik Championship press conference. More than a hundred media, community leaders, sponsors’ representatives, tournament organizers and LPGA officials filled a room at Ruth’s Chris Steakhouse in downtown Ann Arbor as plans were unveiled for the Memorial Day tournament at Travis Pointe Country Club. 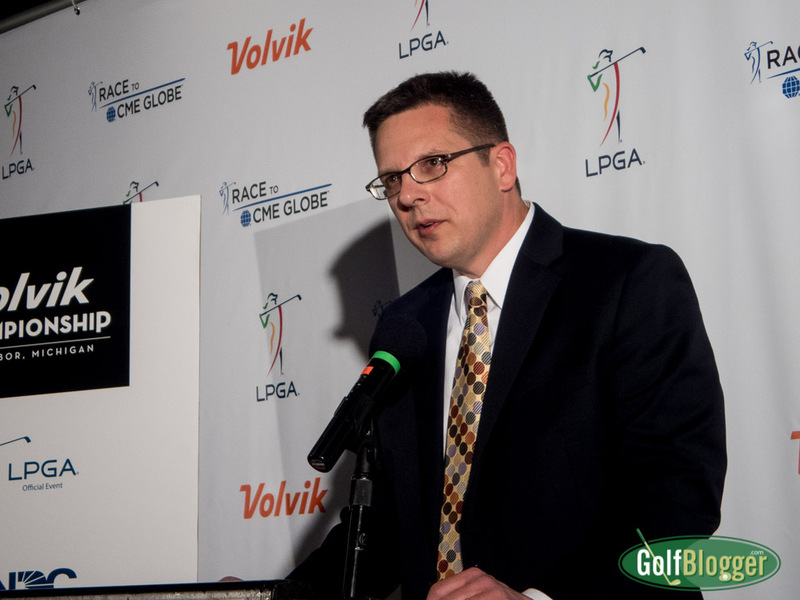 LPGA Volvik Championship Tournament Director Keith Karbo unveils plans for the tournament. The LPGA Volvik Championship’s charity partner is the National Network of Depression Centers, (NNDC) its Military, Veterans and Families Task Group and the Military Support Programs and Network (MSPAN), which is based at the University of Michigan. MSPAN was created in 2008 as a part of the Welcome Back Veterans initiative, and is dedicated to military mental health. Their programs include peer support, parenting intervention and programs for military spouses. 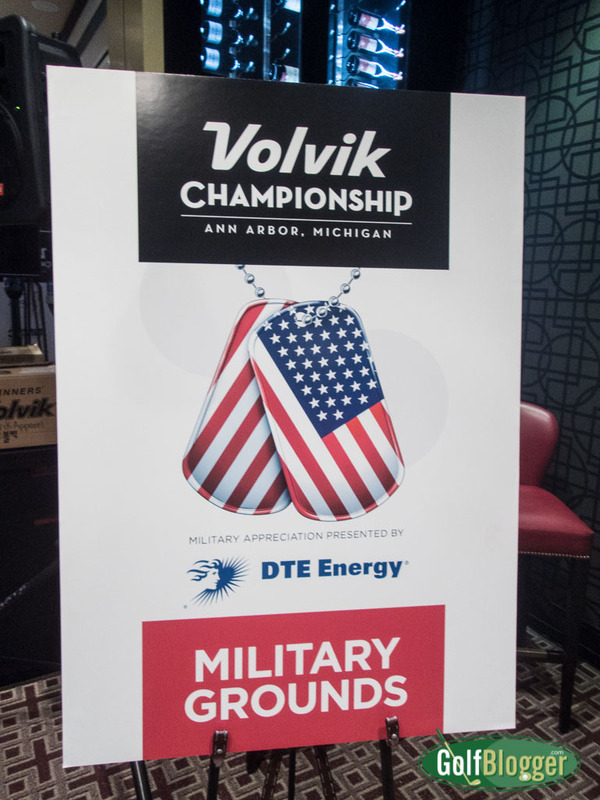 DTE, southeastern Michigan’s energy company, will give active and retired US military personnel and a guest free admission to the tournament. DTE Energy also will provide lunch at the Military Appreciation Pavilion, located near the course’s ninth green. DTE Energy also will work with the NNDC and MSPAN to support their mission of helping military personnel and their families. “We hope to provide our active and retired US military personnel an opportunity to attend the tournament and most importantly, to support military families through our partnership with the NNDC,” said Diane Antishin, DTE Energy Vice President, Human Resources. 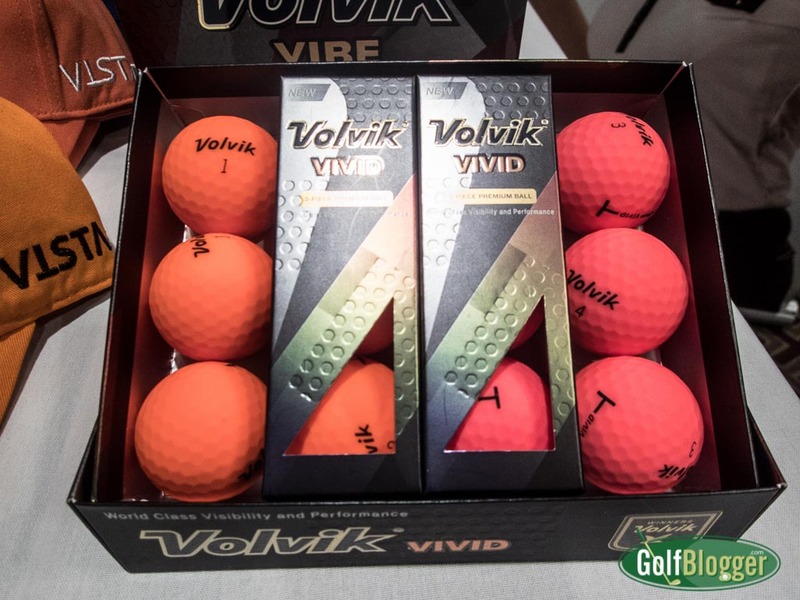 Volvik supports the ChadTough Foundation with orange balls. Tournament sponsor Volvik shows its commitment to causes dear to the Ann Arbor community by supporting The ChadTough Foundation with the Saturday “Orange Out For ChadTough” Day. Volvik is joined in this by local golf superstore Miles of Golf, Rosedale Products, Tee Bagz and Huron Valley Financial. Chad, who lost his fight witha pediatric brain tumor at age five, was the grandson of Michigan coaching legend Lloyd Carr and Hall of Fame Wolverine safety Tom Curtis. The ChadTough Foundation was created in his honor, to increase awareness and funding for pediatric brain tumors. On Saturday, May 28, purchasers of a special ChadTough Orange Ticket package can pick up an Orange Out for ChadTough t shirt and either a sleeve of special matte orange ChadTough Volvik golf balls, a Volvik baseball hat or an orange tee holder made by Tee Bagz, a Michigan company. Ten dollars of each ChadTough Orange Ticket package will go directly to the ChadTough Foundation. 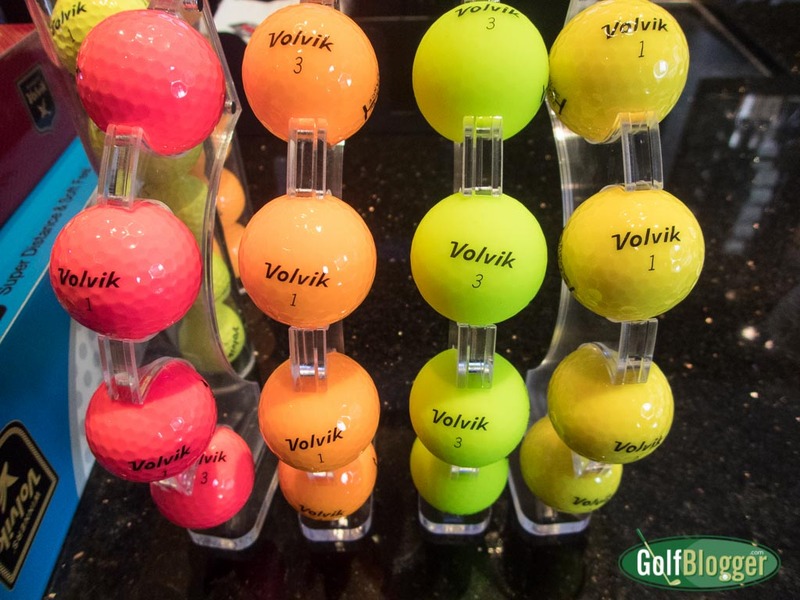 Some of Volvik’s line of colored golf balls. Volvik is the fastest growing golf ball manufacturer in the US market, with more than 350,000 dozen sold in the last three years. Ann Arbor’s nationally recognized Motawi Tileworks was enlisted to produce the Championship trophy. Designed by Nawal Motawi, founder of the tileworks, the trophy will be a unique product. “Designing this trophy was deeply challenging and satisfying. I’m really proud of it” says Motawi. The 12×12 inch trophy tile will be pressed on a 60-ton RAM press with a custom mold that weighs over 100-pounds. After nearly a week in the drying and kiln-firing process, the tile will be hand glazed using bulb syringes, then re-fired, creating a colorful and unique finished piece that will be presented to the tournament champion on May 29. A123 systems, a developer and manufacturer of lithium-ion batteries is the presenting sponsor of the Pro-Am, which will take place on Wednesday, May 25. The Pro-Am Pairings Party will be held at the University of Michigan’s Crisler Arena. Pro-Am players will then have a chance to participate in a “Big Break at the Big House” event with the Golf Channel. 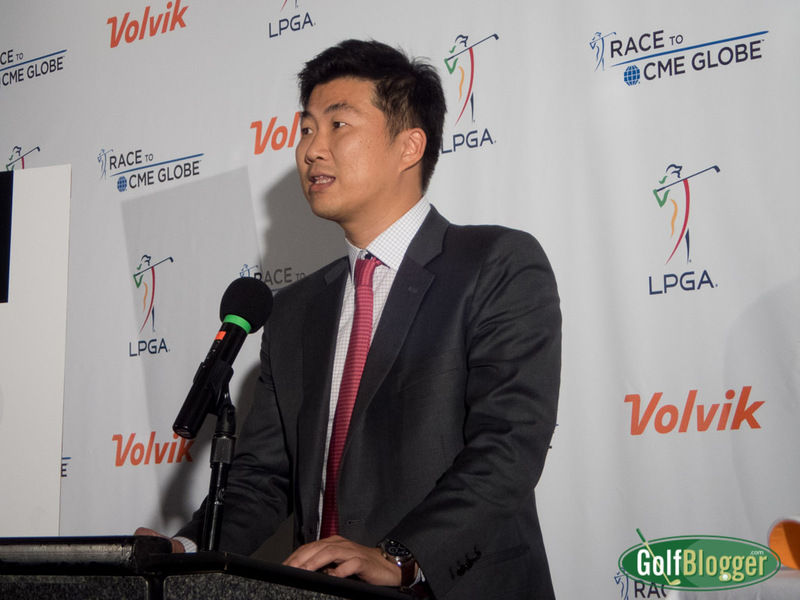 Volvik USA President Don Shin discusses Volvik’s support of the LPGA Volvik Championship and local charities. The LPGA Volvik Championship and the Michigan Interscholastic Golf Coaches Association have teamed to offer high school sports programs a unique fundraising opportunity. From March 28 to April 29, high school golf teams can sell tickets to the LPGA Volvik Championship, with 25% of their team’s total ticket sales returning as a donation to their team’s golf program. Amateur golfers have a chance to participate in the LPGA Volvik Championship through an amateur qualifier at Ann Arbor’s Leslie Park Golf Course on Thursday, May 19. The two amateurs with the lowest scores qualify for an automatic exemption directly into the Official LPGA Local Qualifying Tournament to be held at Eagle Crest Golf Club in Ypsilanti, Michigan on Monday, May 23. From the LPGA Qualifying Tournament, the top two women qualifiers will be invited to play in the 72-hole LPGA Volvik Championship at Travis Pointe, May 26-29. 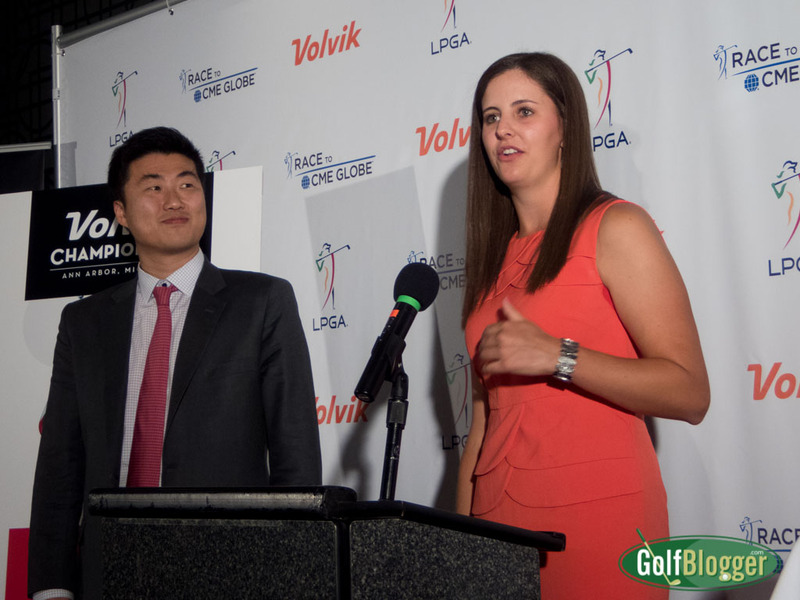 Volvik USA President Don Shin and Sarah Hoffman, who received the LPGA Volvik Challenge’s sponsor’s exemption. Volvik’s sponsor’s exemption is Sarah Hoffman, who played for nearby Saline High School, and then Grand Valley State in Grand Rapids. Hoffman, a two-time All American, studied nursing and until this year was working as a nurse at the University of Michigan Hospital. In February, however, deciding to pursue her dream of playing professional golf, Hoffman quit her job and moved to Florida. The LPGA Volvik tournament needed 750 volunteers and has far exceeded that number. The volunteers represent 95 cities in eight states and Canada. One, from New Mexico, has incorporated volunteering with a family reunion. Although it is not the primary goal, professional golf tournaments can have a positive impact on the economy of the host community. The LPGA Volvik Championship is expected to bring some $20 – $30 million to the area. The Golf Channel alone has already booked some 400 hotel nights.